Baby Bob is an American sitcom that premiered on CBS as a midseason replacement in March 2002, and aired two seasons through June 2003. The Baby Bob character had previously been on television since February 2000, appearing in commercials for FreeInternet.com. While actual infants played Bob, the effect to make him look like he was talking was achieved through computer editing. The series centered on first-time parents Walter Spencer (Adam Arkin) and his wife Lizzy (Joely Fisher), and their six-month-old baby Bob (voiced by Ken Hudson Campbell). After discovering that their son can talk like an adult, Walter decides that they must keep it a secret. Lizzy, however, wants to show off Bob's talking skills, especially to her mother Madeline (Holland Taylor), who constantly brags about her other grandchildren. Supporting cast members included Elliott Gould as Walter's father Sam, and Marissa Tait as Bob's babysitter Teala. The series was panned by critics but premiered to strong ratings and placed 15th in its first week. 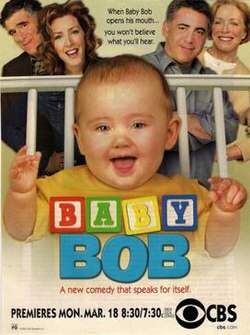 Baby Bob wrapped its first season, consisting of six episodes, in April 2002 with CBS planning a second season of thirteen episodes. However, CBS decided to shift its programming budget to its new series My Big Fat Greek Life and cut the second season order for Baby Bob to eight episodes. The second season of Baby Bob remained unaired for over a year until CBS aired the episodes in summer 2003. After the show's run ended, the Baby Bob character returned to television in a series of commercials for Quizno's. In 2002, TV Guide ranked Baby Bob number 14 on its '50 Worst TV Shows of All Time' list. ^ a b c d From the United States Copyright Office catalog: "Public Catalog - Copyright Catalog (1978 to present) - Basic Search [search: "Midnight Caller"]". United States Copyright Office. Retrieved 2017-06-21. ^ Jasik, Mike (2002-03-27). "Puzzling success of CBS's 'Baby Bob'". Medialife Magazine. Archived from the original on 2009-04-26. Retrieved 2009-04-15. ^ Sullivan, Brian Ford (2003-05-23). "'BABY BOB' RETURNS TO CBS". The Futon Critic. Retrieved 2009-04-15. ^ Schneider, Michael (2007-03-01). "ABC developing 'Cavemen'". Variety. Archived from the original on 2009-04-26. Retrieved 2009-04-15.